Homeowners can take preventive measures to help safeguard their homes this winter. According to the US Fire Administration, residential fires are more common in winter months than any other time of year. As the colder winter months arrive, the danger of fire damage becomes more prevalent due to the increase in cooking and heating fires. Consequently, with high energy costs, homeowners may use other means of heating their homes that are cheaper choices over the public utilities. Though these are good options to keep costs down, they do pose the threat of fire that is preventable. Because these items include fireplaces, space heaters, wood stoves, and other less expensive options. 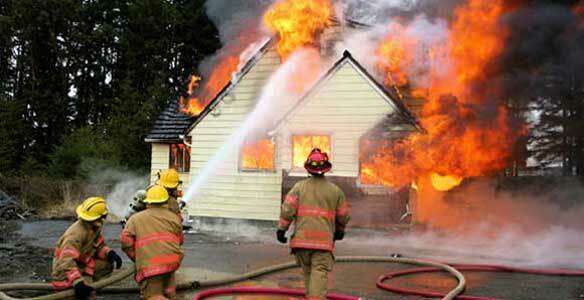 Furthermore, safety precautions should always be taken to avoid any fire damage. Have your furnace inspected every year to ensure that it is in good working condition. Never use a range or an oven as a supplemental heating device. Because not only is it a safety hazard, it can be a source of potentially toxic fumes. If you use an electric heater, be sure not to overload the circuit. Only use extension cords which have the necessary rating to carry an amp load. TIP: Choose an extension cord the same size or larger than the appliance electrical cord. If you have frozen water pipes, never try to thaw them with a blow torch or other open flame, otherwise, the pipe could conduct the heat and ignite the wall structure inside the wall space. Use hot water or as a hand held dryer for thawing. If windows are emergency exits in your home, practice using them in the event fire should strike. Be sure that all the windows open easily. We recommend secure home escape ladders. If there is a fire hydrant near your home, you can assist the fire department by keeping the hydrant clear of snow. Finally, make sure to review your homeowner’s policy with your insurance agent. Due to verify your coverage over your home and its contents in the event fire damage occur in your home.